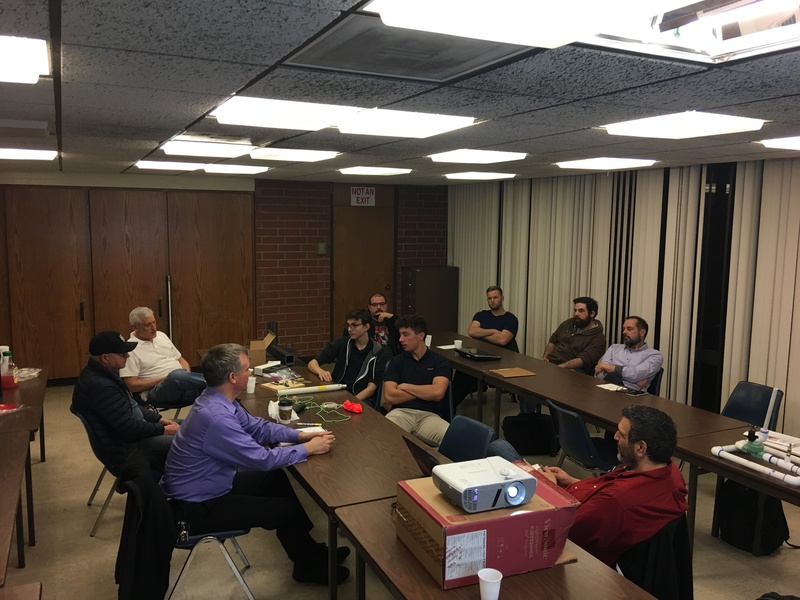 The RRS held its monthly meeting Friday, February 9, 2018 at the Ken Nakaoka Community Center in Gardena. After reading the treasury report, we proceeded with the meeting agenda as listed on the “Forum” earlier this week. The RRS was glad to welcome new student members Jack and Brayden who come from the former Chaminade High School Rocket program. The RRS will be supporting their project to launch a boosted dart ultimately to an altitude of 150,000 feet or more. This work fits nicely into the RRS goals with the SuperDosa project and Jack and Brayden have made a lot of progress already thanks to the help of their sponsors and supporters including the RRS’s own Dave Crisalli. 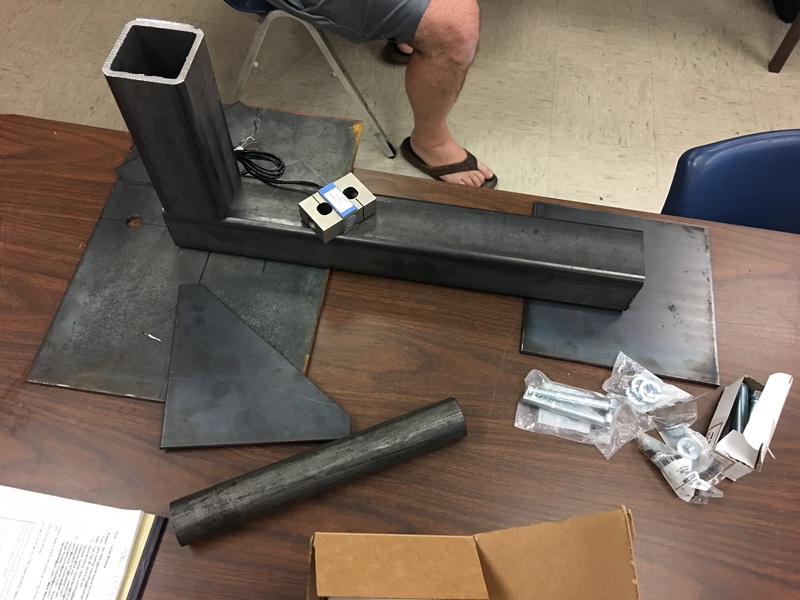 Last year, Jack and his team had a successful motor grain test at the MTA and they are looking to build upon this success for an even larger hot-fire test. RRS as a 501(c)3 educational non-profit group is glad to support our members. On this Friday, the RRS has started the first of five classes with our third group of students from Florence Joyner Elementary School in Watts in conjunction with the LAPD CSP program. The program will seek to schedule a tour of the California Science Center at some point and the five session program will culminate in a launch event at the RRS Mojave Test Area (MTA) on March 24, 2018. The launch date has not yet been confirmed so please look for updates on the “Forum” portion of this webpage. On our third agenda topic, we talked about the progress made to date for the 75th anniversary RRS symposium. We have had great responses from our prior exhibitors and speakers as many are returning for this year’s event on Saturday, April 21, 2018. Our event will have speakers and exhibitors from the aerospace industry, government agencies and academia. The speakers slots have filled up fast so we hope to have our final confirmations given to us soon. 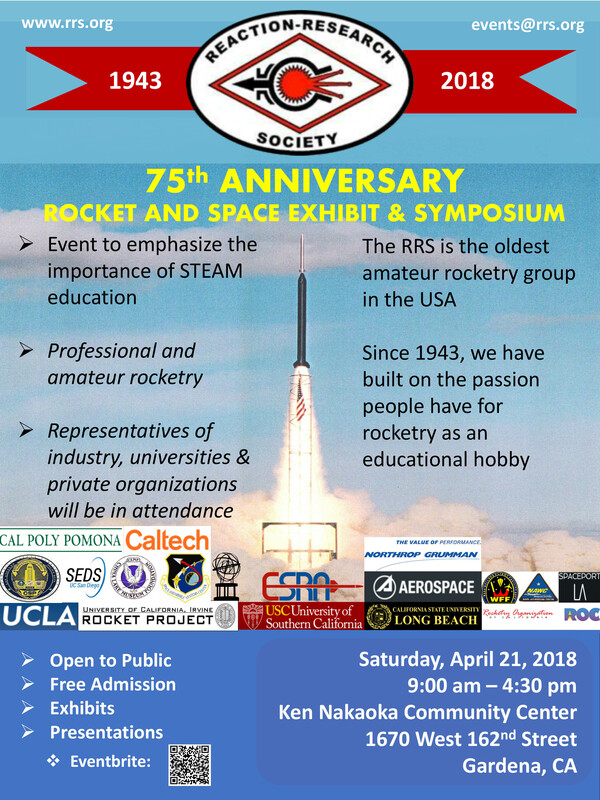 Frank has made the first flyer for this event and we encourage everyone to download a copy and share with everyone interested in attending this event covering topics of professional and amateur rocketry. Frank has said that there is still much to do in preparing for the symposium. This event will likely be bigger than last year’s so we will really need our membership to pitch in and help make this year’s 75th anniversary a success. Weekly phone teleconferences will begin in two weeks. Frank will notify people of their assignments and we will discuss progress at these meetings. Our fourth topic on the agenda discussed the progress I have made with the parachute recovery system I have built for an RRS standard alpha rocket. We launch many of these at our school events at the MTA and even with our membership making their own. 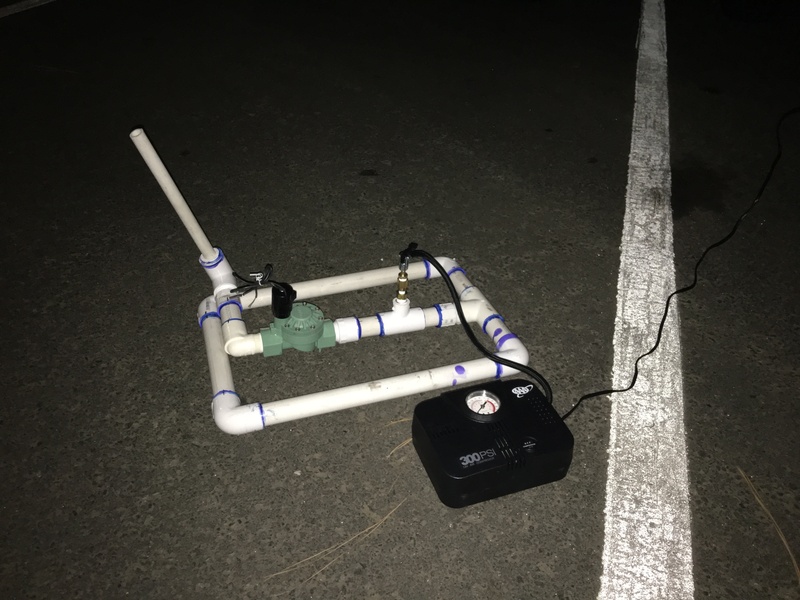 I would like to see more of our members and high schools working with making payloads for the alpha. Given the small size of electronics these days, there are many more possibilities for flying instruments and recording data. 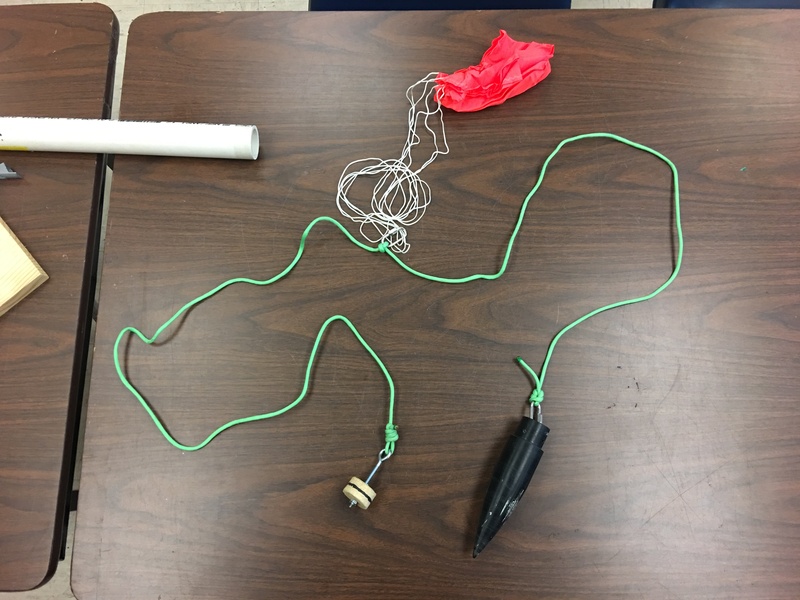 My time was very limited as the meeting was running late and I was only able to show the key parts of the parachute system still in build. 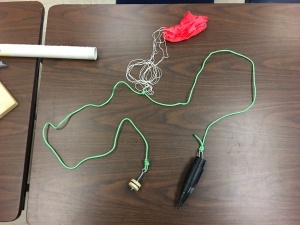 Chris Lujan showed me some better knots for securing my nose cone and tether line to the internal bulkhead. I also showed the 3D-printed plastic umbilical port that Richard Garcia kindly built for me which will make switching on RRS alpha payload much easier if they use PVC payload tubes. I will compile more details soon and if this subject is still of interest, I can elaborate more at the March meeting. Modified 555 timer chip with solid state relay replacing a mechanical relay. Umbilical part in the upper left. I have also been working on a horizontal thrust stand built to test RRS standard alpha rockets. This would allow members to record thrust from the S-type load cell donated to us by Interface Force Inc. of Arizona. All of the structural members have been cut, but the adapter pieces need some changes to make a simpler connection. 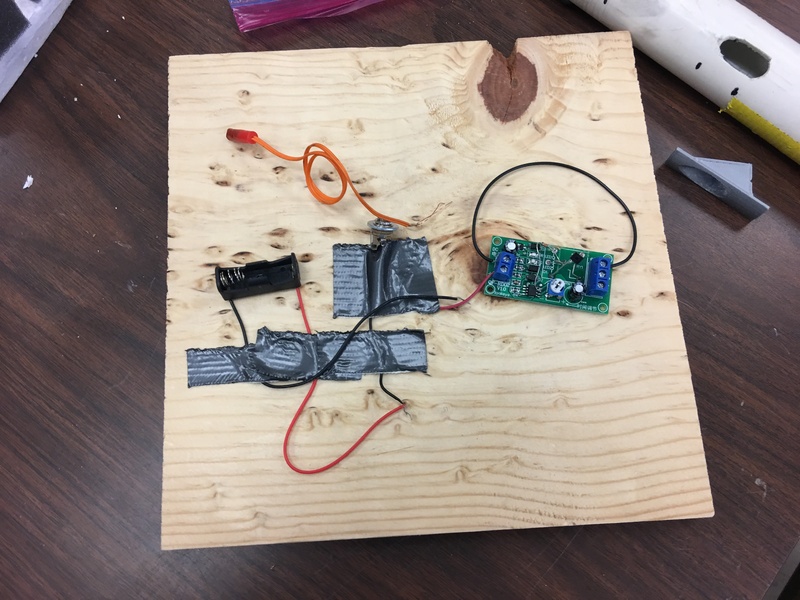 Thanks to Osvaldo for improving my load cell adapter design. 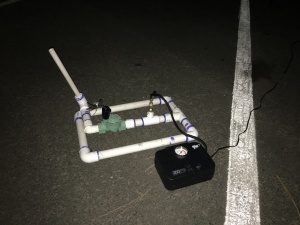 For our fifth agenda topic, Frank Miuccio, inspired by the device built by the Space and Missile Systems Heritage Center (SMC) of Los Angeles Air Force Base (LA AFB) in El Segundo, made his own little rocket air launcher. This simple tool takes an air pump to compress the sealed interior space of PVC piping behind a simple sprinkler valve. Once inflated and everyone is at a safe distance away, the rocket is slipped over the angled launcher tube and is fired by releasing the valve and reservoir of air pressure behind it. Very simple in operation, it is quite fun to play with and we think the kids in our educational programs will think so also. As the last agenda topic, Richard had mentioned that the modifications to his cryogenic methane dewar were complete and that the vessel was back at the MTA. As we were out of time, Richard can explain the details more at the next meeting in March. The meeting adjourned but several of us watched Frank and Chris test fire the small rocket air launcher that Frank had built from Home Depot parts and a battery powered car tire pump. Despite the darkness of night, we were able to recover these small 12-inch vehicles aided by the inclusion of a blue LED in the nose. We had more than a little fun popping these little rockets as high as 100 feet. Our next meeting will be Friday, March 9, 2018 at the Ken Nakaoka Community Center in Gardena. See you there! 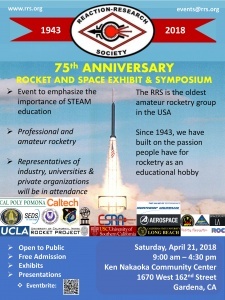 The Reaction Research Society is proud to announce their 75th anniversary symposium on Saturday, April 21, 2018 at the Ken Nakaoka Community Center in Gardena, California. 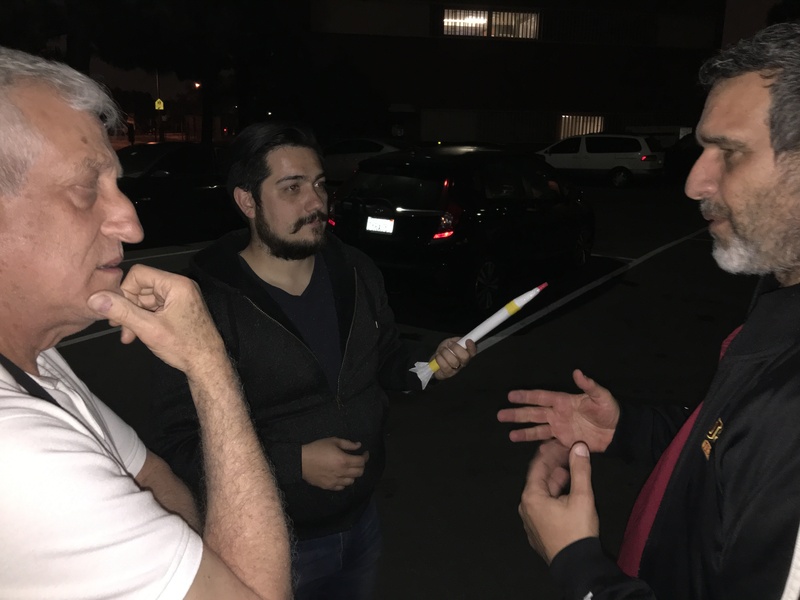 Our 501(c)3 educational non-profit group is the oldest continuously operating amateur rocketry society in the United States. This is a milestone year and we are very proud to share our legacy, history and commitment to our passion for responsible science and learning. Built on the success of last year’s symposium we expect to have an even bigger event with presenters and exhibitors from the aerospace industry, academia, private groups and government agencies. Speakers at our public event will talk on subjects of professional and amateur rocketry. We have already begun our preparations and have confirmed some of our speakers. Our 75th anniversary symposium is coming soon! We encourage all of our membership to help us in preparing for this great event. It is also a good time to consider joining the RRS as we have many great events and projects planned for this milestone year. Hope to see you there!